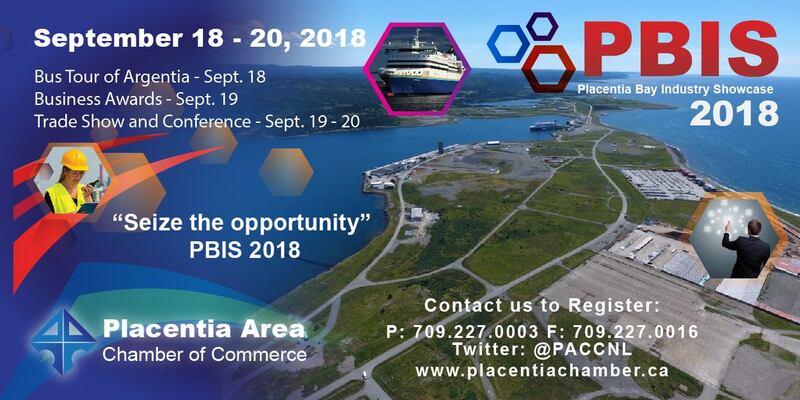 The Chamber will be hosting Placentia Bay Industrial Showcase 2018. The event will build on the successful work we have done over the past few years in facilitating industrial development in our region”. The Chamber recognizes that the list of industrial activities in the vicinity of Placentia Bay is growing each year, and attracting the attention of the regional and provincial business community. Discussions at this premier event will focus on these emerging world class opportunities available to Chamber members and all other stakeholders in these developments. Projects to be included in this year’s event include: Grieg Seafarms NL Ltd., Aquaculture project at Marystown and other sites in Placentia Bay; Canada Fluorspar’s Mine at St. Lawrence; Vale Nickel Plant at Long Harbour; Shipping, transportation and other industrial activities at Port of Argentia; Technology updates from SEM and Edwards & Associates on the use of Drones, ROV’s and other innovative technologies; update from NATI. These are just a few and others are to be added as confirmation becomes available. Thank you for looking into PBIS 2018. Register now and be part of the premier trade show in Placentia Bay!